He added this: “As they’re studies, there’s little attempt at realism. The most realistic ones, to my eye, are the sleeping cats. The dynamism and anatomical accuracy of the action studies contrast with the grotesque cats we’re used to seeing in early Renaissance paintings.” Indeed! I’ve long pondered why artists of all ages have been unable to accurately portray cats. This is a welcome exception, but of course it’s Leonardo! Nana is the protagonist. A stray cat in Tokyo with a strong survival instinct, he is taken in by a young man named Satoru after being hit by a car. Nana finds he has fallen on his feet. Satoru is a cat lover from youth; gentle and intuitive, he still mourns his first cat Hachi, from whom he was traumatically separated as a child. The name “Nana” derives from na, the Japanese word for seven – the shape of Nana’s tail; Hachi was named after the number eight because of markings on his head. Nana is scornful of Satoru’s literal-mindedness when it comes to naming cats, but he has the usual feline instinct for knowing which side his crispy chicken is battered, and decides to stick around. Five happy years of cohabitation pass in a single sentence, and then Satoru tells the cat that they must make a journey. They will visit Satoru’s childhood friend Kosuke, with the purpose of rehoming Nana. Satoru is not forthcoming about the reason. “We just can’t live together any more,” he says. I wrote “Oh no, is Satoru ill?” in the margin, but that’s me; I’ve seen a lot of films. At this stage, Satoru’s motives are officially unclear. The reunited Kosuke and Satoru reminisce about the number-eight cat, and we learn about Satoru’s talent for friendship and the shock of his parents’ death. But does Nana stay with Kosuke? The structure of The Travelling Cat Chronicles is deceptively simple. With alternating sections of third-person and Nana-the-cat narration, it consists of three journeys to friends, followed by a pilgrimage across a beautifully evoked landscape. There is then a heart-breaking last journey that left me in bits. I’ve rarely changed my mind so much about a book in the course of reading it. I started out quibbling with the translation (would a cat that exclaims “Good lord” also say “yada yada”? ), but before long, I had surrendered to Arikawa’s powerful emotional agenda, according to which a human’s love for his cat is not delusional but self-fulfilling, just as all loving sacrifice is its own reward. What Nana observes and experiences through their journeys is Satoru’s huge, lifelong capacity for quiet consideration, which is moving enough in itself. But when the cat responds to his love – well, you ought to laugh, but I couldn’t. “Cats are not so heartless,” declares Nana. “How could I ever leave him?” I know, I know. What a sap I am. But anyone who has ever unashamedly loved an animal will read this book with gratitude, for its understanding of an emotion that ennobles us as human beings, whether we value it or not. Has anybody read this? This is one cat book I’d consider reading! And here’s a brave moggie playing with a huge rhinoceros and her baby. I’m surprised they let it in the room with those beasts! This entry was written by whyevolutionistrue and posted on December 9, 2017 at 9:00 am and filed under books, Caturday felids. Bookmark the permalink. Follow any comments here with the RSS feed for this post. Both comments and trackbacks are currently closed. Beautifully drawn cats, Jerry! Doesn’t the world seem like a better place now? I’m surprised they let it in the room with those beasts! I suspect that they just couldn’t keep it out. Cats being cats, and rhinos needing access to the outside world. I rather doubt this is the first time cat and rhinos have encountered each other(s), even if it’s the first time they’ve done so where the staff (feline sense) have seen them. I’m sure I’ve seen some of those Leo-cat drawings somewhere before. A far as I can see from the video, those are white rhinos (Ceratotherium simum). They are not aggressive, or at least vastly less so then black rhinos (Diceros bicornis). How similar where cats of Leonardo’s time to cats of our own? My understanding is that, Ancient Egypt excepted, keeping domestic cats is a relatively new thing – dating back 200 years or so – and that cats have changed somewhat during that rather brief period. Yes, could the faces of cats have changed over recent centuries? Many zoos employ cats to keep the rodents away. All the fooder attracts mice etc, cats are cheaper, more effective and safer than traps or poison. Well, if we’re posting about cat drawings and cat fiction, a somewhat underrated (albeit not great) example of both is the 1960s cartoon “Gay Purr-ee” about two cats in Paris starring the singing voices of Judy Garland and Robert Goulet. 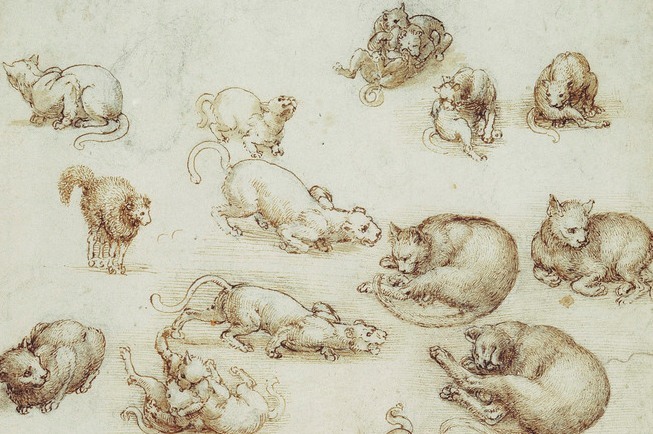 What is that little dragon doing there among Leonardo’s cats? “The Travelling Cat Chronicles” is a wonderful story, told with humour and poignancy. I definitely recommend it.